Having oily skin tends to limit the type of foundations I can wear, especially in the warmer months. However, as I've gotten older (the ripe old age of 32), I've craved a more natural, luminous look. I can certainly achieve that with a lighter layer of foundation and application of highlighter, but I love finding foundations that can help me get a similar look with less product. 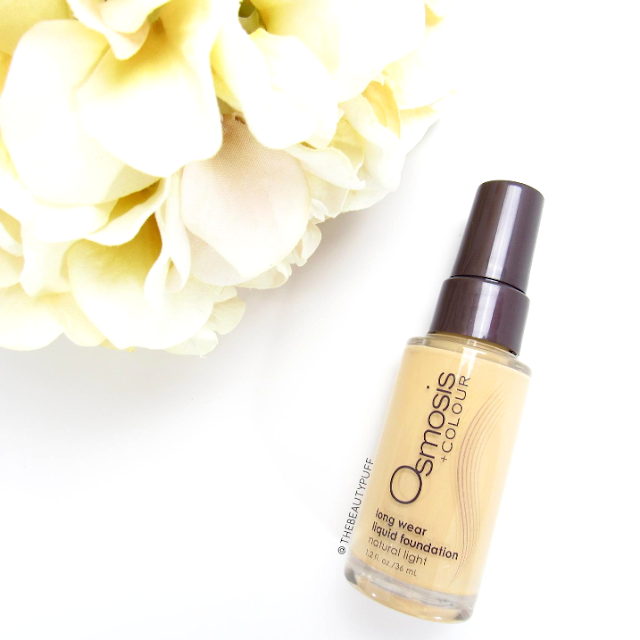 Osmosis Colour Long Wear foundation provides a semi-dewy finish that has been a much-loved essential in my makeup routine. The Style | This foundation comes in a sleek bottle with a pump. It doesn't get too messy after dispensing which I really like. The cap fits securely over the pump so it will stay closed if you travel with it. The Formula | Smooth smooth smooth! I can't say enough good things about this formula. It blends like a dream no matter what primer I have on underneath. The coverage is amazing too. It covered all my redness and uneven tone in one layer. If needed, you can definitely layer this foundation and build up the coverage in certain areas. It's not the least bit cakey! As someone with oily skin, I do set this (and every) foundation with powder. I just use a light-weight loose powder so I don't alter the beautiful finish too much. This foundation also contains a Goji Berry Blend Extract with antioxidants to improve skin with every use. The Wear | Throughout the day this foundation looked fresh and flawless. It did not oxidize or gather in my pores at all. As usual, my oily skin made blotting a necessity part way through the day. Thankfully nothing looked blotchy or worn away because of my oiliness. My powder products wore beautifully over this foundation too. Overall, my skin looked smooth and healthy, definitely loving this one! If you missed my last post featuring Osmosis click here. You can explore the Osmosis Colour Mineral Makeup collection below!